Does your child need help reaching high objects? 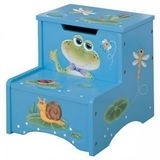 Why not add a step stool from our Froggy Collection. This step stool will make a great addition to any little child's room. It will also make it easy for them to access hard to reach objects. The Teamson Design furniture is made of MDF (Eco Friendly MDF/Engineered Wood). MDF is made of wood fibers compressed with adhesive. It's denser than particle board, and the surface is very smooth. MDF board is extremely strong and resistant to warping, and it's easy to cut, drill, and machine. Best of all, MDF saves money and can be good for the environment.